Restoration of vintage vehicles belonging to OCHS began in September 2012 when the Studebaker fringe-top surrey was moved from the crowded urban barn to a local residential workshop. Once the restoration was complete, it became apparent that it was not wise to return the vehicle to the barn that lacked climate control and protection from animals. Thus began the drive to build an addition to the George E. Hall Annex to properly house the vehicles in the collection. The Grand Opening on May 12, 2016 was the culmination of countless volunteer hours and many generous donations. The Historical Society is forever grateful to the Leon H. & Clymene M. Bond Foundation for its kind donation which provided us sufficient funds for construction. The 5,200 square foot addition boasts a meeting room with warming kitchen, gift shop, and amenities. 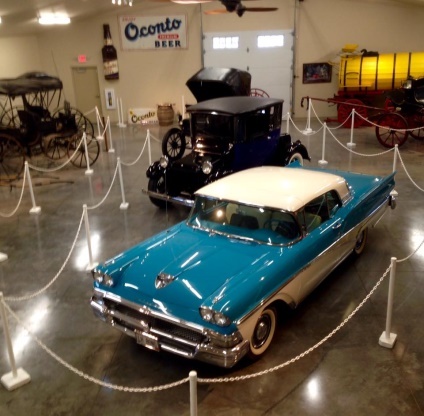 The display room showcases the vehicles in the collection, many of which have been beautifully restored. Exhibit text and photos enhance the experience. The collection includes a dugout canoe and birch bark canoe traced to indigenous tribes in the area. Other water vehicles include an ice sleigh used by local Norwegian fishermen and a Cruisers boat donated by KCS International. The horse-drawn vehicles on display include a road cart, a drop-front phaeton, a Studebaker fringe-top surrey, a leather-top surrey, a five-glass landau, and a Studebaker water wagon. Two cutters and a two-seated sleigh are also exhibited. Motorized vehicles include a 1911 Waverley electric car and a 1931 Detroit Electric car, as well as a 1958 Ford Fairlane 500 hard-top convertible owned by Leon Bond. Displays featuring a four-foot model ship made by Cyrus Hart, a fire hose cart, the Park Avenue Circus, the Oconto Brewery, and the Stanley Toy Factory complete the exhibits.